@Metroplex360 Did you get answers to your question about pricing? I'm not sure we have your email. Could you please share it via PM and we'll make sure to follow-up with pricing? 7 exposures seems ok, (and understand the current 360 jpg will be fine for most people) but always preferable to have high range when possible prior assembling hdr (like in a .cr2 to ptgui 360 workflow) or to get a higher bitdepth 360 pano output to play instead of jpeg (ex: .exr, .hdr, 16 bit tiff) to do proper tone mapping and color balancing w/macbeth or similar. Got you, thank you for the feedback! Keen to learn more about GeoCv's solution, waiting for the answer on the beta invite still. I really hope to scale to Canada sooner rather than later. 1) Will the beta version include integration of exterior 3D and 360° visuals captured with a drone? If so, are there additional costs involved? Incorporation of exterior 3D scans and aerial 360 panoramas captured with a drone is our premium feature, which is not yet included into subscription and has project-base pricing in the range of several hundreds US dollars per tour. We do hope to automate it at some point to exclude extensive involvement of our post-production team, so it could be included into subscription or at least become more affordable. And the feedback from actual customers using it more and more would facilitate this. According to Inman such GeoCV 3D tours "blow minds", so it's worth the effort and investment at least for selected properties. - You need a regular drone with a good enough camera (for example, we used Phantom 4 Pro V2.0). - Flight automation software such as DroneDeploy is recommended. You should be also able to fly manually. - We provide you guidelines for shooting (see brief description below). You shoot and send us the images. - We use photogrammetric software to stitch them into 3D scan and optionally align 360 images to the 3D scan. - We align the exterior 3D scan with the interior 3D scan, and import all the content into GeoCV 3D tour. - The whole process might take several days. - It includes automated regular grid trajectory for oblique and nadir shots, which could be automated via DroneDeploy software. This allows you to capture the main content for the house and its surroundings. We also recommend to additionally manually fly around the house in a few circles at multiple altitudes to provide better coverage, quality and level of detail. If flying at low altitudes is prohibitive, you might need to walk around the house with the drone in your hands. - For any trajectory, consequent images should have large, e.g. 80%, overlap. If possible, the whole house or its larger portions should be visible in the frame, unless these are the images for surroundings. Different flight sessions should have a large enough overlap in trajectory or coverage, e.g. they should start capturing from the approximately the same point. - You can optionally capture aerial 360 images, which we could integrate into GeoCV 3D tour both aligned to the exterior 3D scan and as highlights. You should use third-party software to capture and automatically stitch these images. We require both the stitched images and source frames for each panorama. - While shooting with a drone for photogrammetry is not that hard, it does require some skills and experience, so please be prepared for some trial and error learning curve. At least in the beginning until you master the skill, it might be a time consuming process, e.g. could take 2 hours, so it's recommended to have a few extra batteries fully charged before the shoot. 2) Can you give examples of an exported 360 view? Will you also be able to export still images? Can you provide an example? Yes and yes. We'll prepare and publish some samples of all exported deliverables including floor plans, 3D model, 360 panoramas and still photos. We're currently upgrading our app to shoot in HD, i.e. 4x higher resolution than you currently see in our 3D tours now, so we probably release these samples after such an upgrade. AntonYakubenko - there is chance to test GeoCV in Europe? I'm from Poland and want to participate. I must mention that I have been waiting for this very badly for year plus. MP is/was? monopoly in the market - ruling with it’s own terms. 1. Possibility of offline showcase - I don’t mind if you make it like a software player with license renewal. You still make your money recurring basis. (More than 40 deg?) - should this vary with different cam/phone? 3. Any thought/possibility of post processing the content locally? - for instance where confidentiality is the priority where we are literally not allowed to take out the data from premises. Could work like a software with license key. 5. Why not get away with “powered by geoCV” once in the scene. The UI is so neat but for this line - I understand you have the white label option but still. 6. View options - as in typical CAD environment I very much miss this feature. It is so convenient to have standard views to choose from. Just the top and orbit are not handy. Best wishes and I sincerely wish that the legal course will be in favor and we all benefit equally. We are currently serving only the US but we plan to go international sooner rather than later. Please fill out this form https://geocv.typeform.com/to/yhblCG so we could notify you when GeoCV solution is available in Poland. Thank you! Vertical FOV is 132 degrees. We've found that it's more than good enough for the absolute majority of applications and users, while providing a good balance between FOV and capturing time. It's also close to Google Streetview recommendation of minimal FOV. If we see the demand for larger vertical FOV, we can introduce an option for that as well. Our panohead can rotate full 360 degrees around horizontal axis, so only nadir would be occluded by the panohead and tripod. And these nadir areas might be patched either by imagery from other panoramas or by a branded circle. Sorry for that. We send responses in a manual fashion for now in batches, so some delay is expectable. Please mind that we are currently serving only the US, but we plan to scale internationally sooner rather than later. We don't provide this yet, but we could consider this for very large volume projects. We've been always promoting hardware agnostic approach, so we would be happy to support other input devices in longer-term future. We believe it's important to promote either our brand or brand of service providers, which should increase number of 3D tours created. In my opinion, our implementation of GeoCV branding and white labeling is balanced, so brand is visible, but it doesn't distract users from the experience. And anyway you can remove this part in white labeling. In my opinion, standard views would be an overkill for the absolute majority of consumers, and would make 3D viewer crowded with buttons or options. I do understand though that it could be useful for more professional use cases, so we might add such an option in the future and allow our customers to toggle these standard views on and off. Well, I am all MAXIMUM fov (132 is way short cut). I am sure most others do feel the same. I am always questioned by the audience about the nadir patch with 360 videos and for sure unhappy clients of MP with two fold of it and that too with huge space eaten. Kills the "immersive" & "360" factors totally. I am ok to spend little extra time at shoot than regret for it forever later. Local processing - We don't provide this yet, but we could consider this for very large volume projects. The interest has specific cases in mind - which are not volume driven to be clear. Would be great to know if this could be bargained on value proposition and credits than volume. ....... so we might add such an option in the future and allow our customers to toggle these standard views on and off. Toggle switch sounds perfect... One of critical use case is measurement. BTW, what about the measurement feature of the space captured? 1. A sample of low light space would be of interest to look at. Example of a bar-restaurant in night. How good is post processing is taken care for the noise? 2. Which other latest mobile units are tried? 3. What about the warranty on performance of the motors driving the rotation? Any claim on minimum numbers? 4. Tentative timeline to go public with pricing of hardware? 5. Access to capture data - does user get to access the raw shots from the phones? Data management of the capture data - backup system, cloud and local. 7. Are you using standard NP series batteries for the unit? or any other which can be swapped? 8. Possibility VR & followed by STEREO version? Agree that larger FOV would feel more immersive, especially in VR. At the same time, to be honest, it's maybe the third time out of like a thousand, we hear anyone asking for a larger FOV. And the cases when it was needed were very unique, e.g. industrial or documentation vs marketing. I would also say that for regular homes adding vertical FOV on the top won't bring much more information, because it's usually just white ceiling. Adding FOV on the bottom is hard due to occlusions caused by the tripod and panohead itself. So especially given it would require a bit more time on site, I think this is a good option, which we could add in the future and which could be chosen by our users at their own will. If development efforts and risks are justified, we're open to discussion. We plan to add some measurements tools in the future. We'll disclose support of other smartphones when it's ready. 1 year limited warranty on the GeoCV Scanner. We do extensively test our panoheads, including on how many times they can rotate, and while we don't disclose the exact number, it would be more than enough for years of shooting. These are too deep technical questions. Just know that your data is in safe hands. Range or the depth camera we're using is around 15 feet (5 meters). Usual accuracy of linear measurements is around 98% (but we can't guarantee particular metric accuracy). We export 3D model as OBJ. If you need other formats, in particular, point clouds, we're open to supporting them after understanding problem you want to solve better. We're using standard rechargeable replaceable batteries of 18650 type. VR is in our product roadmap. 5. Access to raw data - why? It’s been like week time that I lost a ticket (from a client for whom we had already served worth about $3500 a month ago) and the second phase was worth $5000. Reason - I am unable to provide source data. The least I could commit is original images as the source files used to build the whole experience. With my current workflow I don’t have this liberty. As you have offline access it makes life easy on one hand. Is that an executable file you provide? 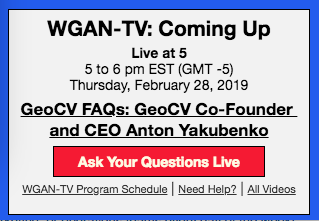 If you would like to be reminded when we go live today (Thursday, 28 February 2019) with WGAN-TV Live at 5 with GeoCV Co-Founder and CEO @AntonYakubenko ... Subscribe to the WGAN-TV YouTube Channel and enable the bell for notifications. Plus, when we're live, you can join the program to ask Anton your questions directly using this link or click on the red bar in the bottom-right popup. screen grab from the WGAN-TV Live at 5 Popup (bottom-right of WGAN Forum. 1.What is the minimum range of the camera (very tight spaces or car interiors) before stitching errors occur? 2.What is the battery life of both the rotator and the camera? 3.What is the required spacing between shots? 4.How long does it take to take one shot? Great question! Since our camera rotates accurately around nodal point, there are no stitching errors even at very close distances. 3-4 hours for each of them. Though you can go longer than the following, for robust and accuracy we recommend not to exceed 8-10 feet (2.5-3 meters) in between the shots. 39 seconds. Then it takes ~6 seconds for processing right on the phone, but you can already move the camera during processing. There is no extra time to transfer data from the camera to iPad or something, since all the computation is done on the phone used for capturing. Please also mind that in reality photographers spend some time just to move the tripod from spot to spot, so the total efficiency on site depends equally on the solution and the photographer. 1. What is the best solution if I require more shooting time when the battery runs out? 2. How long do the batteries take to recharge? 3. How many shots per battery charge? Can you join the show tonight to ask Anton questions? Always love having you on the show. @Anton, is it possible to map the external drone 3D on to the dollhouse? Idea is to be able to see both merged and seamlessly transit into the walkthrough mode. May be a bar with transparency adjustment for drone model should be interesting to see through and transit with click in. Branding - possibility of having branding of the client on main screen and the service providers' on the left pull down window? I hope the title "capture by" is free to be changed or even removed on the main screen? As a client the logo of the company alone looks nicer without any title. Yes, you have a myriad of combinations how to show or don't show client's and service provider's branding. For example, service provider logo is shown only on the loading screen, so if you don't upload logo, there won't be service provider branding on the loading screen. You can also toggle showing or not showing service provider name in the left Info Block sliding panel and independently in the bottom right corner. Similarly, you can upload client's logo, which is shown on the loading screen and in the Info Block. You can also customize how Info Block looks like in the closed state, i.e. round image and text in the top left corner. Yea I had overlooked at it earlier. The dollhouse and drone data are mapped. Not very evident. May be you can flash the scan spots at some interval so the viewer gets a hint? 1. Add transparency tab if not bar - to switch between visibility of dollhouse under drone scan. 2. Section cut/plane is another feature - i know it is not for most of prop showcase but would be interesting to know your take on efforts to pull off one. One would enjoy playing with it once you have the interior and exterior mapped otherwise AEC must find it pretty handy. any sample of exported stills available yet. Since we've just released HD capturing, and are working on stills extraction from HD panoramas, we'll need a bit of time to share something representative. I do understand that it's an important feature for many customers, and thank you for your patience. ok great, thank you. since the beta sign up ends on the 15th. can you let us know what future features may be included? Might make it easier for ones still debating on signing up (like myself) . just have a hard time justifying the monthly fee. The market I'm in is very different than the market you are used to. Most of my clients are only interested in still photos. I photograph about 2000 homes per year. Out of that only 20-30 are matterport tours. ok great, thank you. since the beta sign up ends on the 15th. can you let us know what future features may be included? Might make it easier for ones still debating on signing up (like myself) . just have a hard time justifying the monthly fee. This is TBD, but you can always downgrade if any future plan works best for you. The market I'm in is very different than the market you are used to. Most of my clients are only interested in still photos. I photograph about 2000 homes per year. Out of that only 20-30 are matterport tours. That's actually very interesting. I wonder what we can do together that 200 homes out of 2000 would have a 3D tour, and then 2000 out of 2000? I doubt 3D tours solution price is the barrier, because on such a scale our unlimited plan should be ideal. Why realtors are not ordering more 3D tours? What we can do to change this?